Mitchell Callahan has signed an NHL contract with the Detroit Red Wings. It's a three year deal. Terms were not disclosed. I spoke to Callahan moments ago. As mentioned earlier this week on the blog, Tyler Myers of the Buffalo Sabres will suit up for Canada at the World Championships next month in Germany. The six-foot-seven Myers is a finalist for the Calder Trophy after putting up 11 goals and 48 points in 82 regular-season games with the Sabres. The 20-year-old is a dual citizen because he was born in Houston and moved to Calgary when he was 10. He made the decision to play internationally for Canada as a junior. Myers is one of 6 players - 20 or younger on Canada's entry. I spoke to Rockets general manager Bruce Hamilton, who is in Edmonton for the WHL bantam draft. 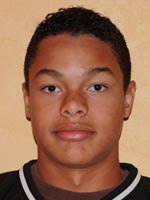 Hamilton confirms the team has received a commitment from 16 year-old Colton Scissons. Scissons was acquired in the Curt Gogol deal with Saskatoon. Scissons played with the Westside Warriors this past season. The Rockets give up a 5th rounder to the Blades if Scissons plays in the WHL this upcoming season. Monarchs head coach Rob Reimer said. "I've coached Scott Glennie and Cody Eakin, and I'm sure of them going to the NHL, which they will be. This one, I think, has gotta go. He's gotta go. "I've (coached) 14-year-old teams for probably about 12 years now, and this is probably the best defenceman I've seen out of the group yet." Along with being a highly athletic kid, Madison Bowey is turning out to be a high prospect in the upcoming WHL Bantam Draft. Mainly because the 14-year-old defenseman has got game, and lots of it. This season, while leading the Winnipeg Monarchs to the top of the WMHA AAA Bantam league standings with a 26-4 record, the young defenseman finished 3rd in the league, scoring with 57 points in 29 games. Scouts have described the young star as being an excellant skater, with incredible raw skills, acute hockey sense, a hard and crisp short-range pass, and having a powerful, accurate wrist shot. Many have compared the top ranked Manitoba 14-year-old to the New York Rangers, Michael Del Zotto. He is ranked to go No.2 this season in the Bantam Draft, behind the uber-talented Alex Forsberg. If that is indeed the case, their is a good chance the Edmonton Oil Kings could land the phenominal defenseman, and he would join another great young blueliner with the likes of Vancouver native Griffin Reinhart. There could be a lot to be excited about, for fans of the Oil Kings in the upcoming years, with these two outstanding rearguards in their lineup. Born: Winnipeg, MB. April, 22 1995. 2009-10 Statistics: 29 GP, 15 G, 42 A, 57 PTS. So the Rockets select two d-men with their first-two picks in this mornings WHL bantam draft. Calgary's Jesse Lees was picked 9th overall in round one with Madison Bowey of Winnipeg chosen in round two. In the third round the Rockets went with 5 foot 8 - 140 pound forward Tyson Baille of Fort Saskatchewan. The Kelowna Rockets selected a defenceman with their first pick in today's Western Hockey League bantam draft. The Rockets picked Calgary resident Jesse Lees 9th overall. Thanks to Debbie Friesen for the link. It's a Kelowna Rockets franchise first! Congratulations Tyson Barrie for being named the Western Hockey League defenceman of the year. The 19 year-old picked up the honour at today's Western Hockey League awards banquet in Edmonton. Barrie is the first Rockets d-man to win the award, and is the first player from the organization to ever claim an individual league award. Barrie led the Rockets in scoring with 72 points this season and tied Vancouver Giants 19 year-old Kevin Connaughton for the league lead in scoring by defenceman. Barrie beat out Eastern Conference nominee Michael Stone of the Calgary Hitmen. 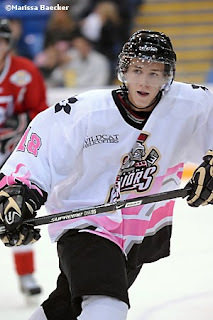 Barrie was taken 18th overall in the 2006 WHL bantam draft. A third round pick of the Colorado Avalanche in 2009, Barrie is expected to return for his fourth and final season of major junior hockey in 2010-2011. An odds on favourite to be named team captain, Barrie should also have a good shot of playing for Canada at the World Junior Hockey Championships. Once again congratulations Tyson for being named the Western Hockey League's top defenceman. Shane McColgan (west nominee for rookie of the year) and Spencer Main (west nominee for scholastic player of the year) failed to win the league award. Congrats to Shane and Spencer for being named conference winners...no small feat in itself. The Rockets have the 9th overall pick in Thursday's WHL bantam draft. It marks the first time since 1998 that the Rockets pick in the 9th spot. In 1998, head scout Lorne Frey selected defenceman Richie Regehr. The Rockets haven't picked this high in the draft since 2007, the year Arizona born Luke Moffatt was selected 2nd overall by the hockey club. In 2000, the Rockets picked goaltender Josh Lepp with the 4th pick overall. 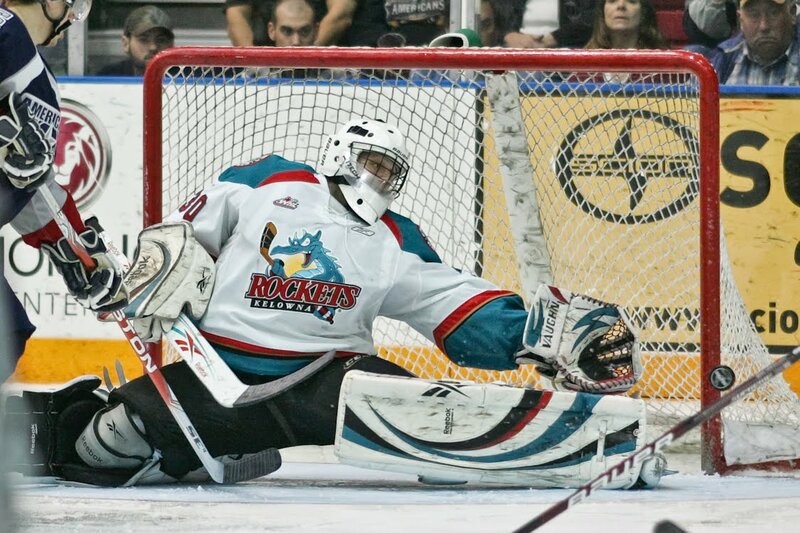 Other picks in the top 10 for the Rockets were Kevin Reinholt 2002 (10th overall), Kiel McLeod in 1997 (8th overall), Jason Ryznar in 1999 (5th overall), Scott Hannan 1994 (8th overall), Kyle McLaren 1992 (5th overall) and Adam Smith 1991 (1st overall). With the Rockets selecting 9th, I thought it would be interesting to see what type of player other teams have picked at that draft position. Let's exclude last years draft as that player picked 9th overall was unable to participate full time as an underage 15 year-old. Tyler Myers season with the Buffalo Sabres may be over, but don't be surprised if he is summoned overseas. Myers will likely play for Canada at the upcoming World Championships in Germany on May 7th. Myers and his Buffalo Sabres were eliminated from the playoffs last night by the Boston Bruins. Myers will most likely be joined by Nashville Predators defenceman Shea Weber, who had his season end with a playoff loss to Chicago. It looks like the The Chase Chiefs will be relocating to the city of Kelowna. At Monday's council meeting the KIJHL franchise was given the green light by members of council to play out of the Rutland Arena next season. Council says an agreement in principle has been reached with the Kelowna Rockets, who had first right of refusal for the team to play in the city. All that's needed now is formal approval from the Rockets and the KIJHL. The Chiefs will play 25 home games and will undergo a name change. One suggestion is to call the team the Buckaroos. Jon Keen on his blog is reporting that Swift Current Broncos forward Matt Lowry will indeed be at the WHL awards banquet Thursday in Edmonton. That tells me one thing. Kelowna Rockets forward Spencer Main, the Western Conference nominee for scholastic player of the year, won't pick up the award. Lowry will. Only the winners are invited to this thing. Now that Tyler Myers season is officially over with the Buffalo Sabres, don't be surprised to see him in Kelowna in a couple of weeks. Myers will be making his off-season home in Kelowna this summer, joining a long list of NHL'ers that spend roughly four months in the Okanagan. Myers was not only a teammate of Tyler Ennis' in Buffalo, but Ennis was Myers house guest during his brief playoff appearance. Instead of the Sabres housing Ennis in a hotel, Myers elected to open his condo to the former WHL sharp shooter. One member of the Kelowna Rockets will be disappointed with the Vancouver Canucks opening series win over the LA Kings. Forward Shane McColgan was at the Staples Center for two of the Kings three home games in the series. McColgan lives just 15 miles from the LA Kings home arena. McColgan lives in Hermosa Beach, California. Happy birthday to Brett Bulmer. Bulmer turns 18 today. Do you remember J.J Hunter? How about J.J's younger brother Luke? The two former Western Hockey League players have joined three other siblings as they attempt to break into the music scene down in Nashville Tennessee. 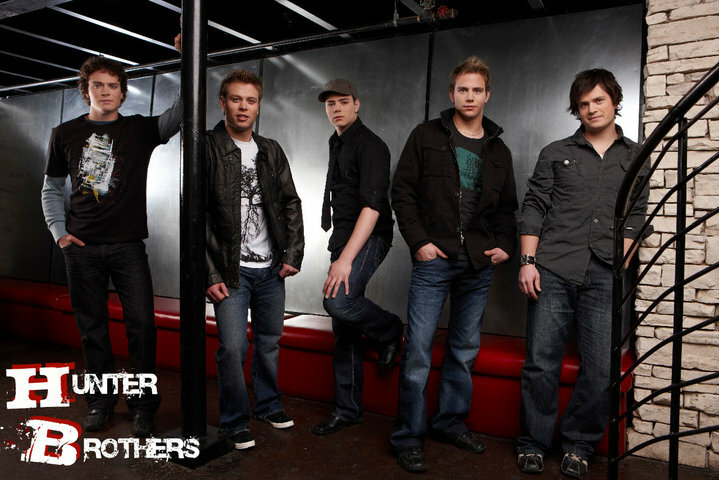 The 'Hunter Brothers' are no strangers to music, having toured as the 'Hunter Family', singing at various gospel festivals across Canada and the United States over the years. 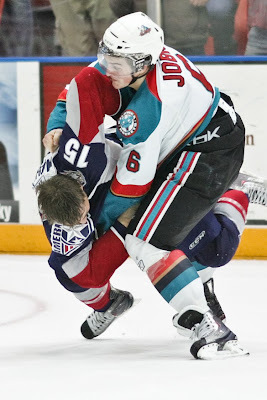 J.J Hunter played 144 games for the Kelowna Rockets between 1998 and 2000 while Luke played 315 games for the Swift Current Broncos between 2001-2006. Check out the Hunter Brothers on facebook. In the picture above, J.J is on the far left with Luke next to him second from the left. 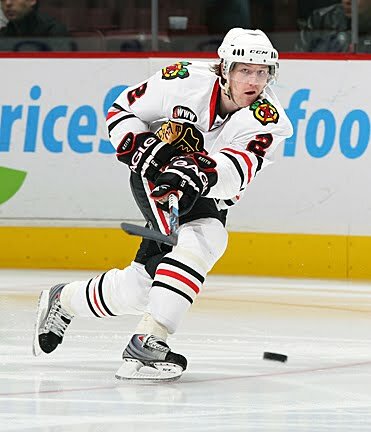 Former Kelowna Rockets defenceman Duncan Keith has been named a finalist for the NHL defenceman of the year. "Obviously a huge honour. I'm pretty proud. A lot of hard work, and I can't say enough. It's a huge honour and it's great to be nominated." Keith helped the Rockets to a Western Hockey League championship in 2003 before eventually suiting up for the Chicago Black Hawks. "You look at other people who have been nominated and other people who have won it, it's a pretty special category and one that I am pretty proud to be apart of." It's been a good week for Kelowna Rockets alumni now playing at the NHL level. Tyler Myers of the Buffalo Sabres was nominated Thursday for the NHL rookie of the year. Tyler Myers of the Buffalo Sabres has been named one of three finalists for the Calder Trophy as the NHL rookie of the year. I spoke to Tyler's dad Paul earlier today about being recognized as one of the best first year players in the NHL. "It's been better than I expected. The thing with Tyler has always been to manage his growing. Consistency has always been an issue with him and a lot of it had to do with him growing so much, and that's finally settled down. He's added strength over the last year and that's really helped him a lot," Paul Myers added. "It's an incredible honour for him and it's really exciting. He's had a really good year and he's right up there with those guys so it will be interesting to see how it works out. However it turns out he can be quite proud of just being nominated". Being eliminated from the WHL playoffs gives me a chance to listen to my colleagues either in major junior, semi pro or in the National Hockey League. I've been impressed with the call of Manitoba Moose play-by-play man Brian Munz. Munz and I know each other and often swap e-mails over the course of the season, yet I don't have a chance to hear him call a game. I knew that 'Munzie' was no stiff behind the mic, but he calls a great game, as I witnessed Saturday when his team is getting shellacked in game two of a playoff series with the Hamilton Bulldogs. Those are the toughest games to call, yet Munz showed that he is a true pro by keeping it interesting without the help of a colour man. No, I am not getting royalties for this endorsement, but he's got to be knocking on the door of an NHL job down the road. 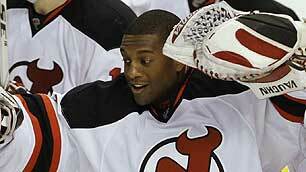 Former NHL goaItender Kevin Weekes surprised me. Weekes joined Hockey Night in Canada in September, and is evolving in the booth. Sure he has areas that need refining, but I like his look on camera. He's relaxed, well spoken and has a good grasp of the game. The nice thing is Weekes will only get better with more games under his belt. He's only 34. I am a fan of Dean Brown. I don't know the man personally, yet the Ottawa Senators play-by-play man is getting a first round assignment with CBC calling the Sabres/Bruins series. Great voice..solid call. He won't get the big assignments nor the headlines of the Jim Hughson's of this world, but solid work by a solid play-by-play man that gets little attention out West because we simply don't hear him often. I like him. Mark Guggenberger and Lucas Bloodoff won't be on the ice when the Manitoba Moose open the American Hockey League playoffs tonight against the Hamilton Bull Dogs. Guggenberger and Bloodoff were called up to the Moose after their season ended last Friday with the Kelowna Rockets. Guggenberger and Bloodoff are two of seven players practicing with the Moose and will only see playing time if someone gets injured. #10 When are the Anaheim Ducks going to announce they've signed Rockets forward Brandon McMillan? #9) Will Lorne Frey select a defenceman with his first pick in this month's Western Hockey League bantam draft? Frey has picked a forward in three straight drafts (Moffatt 2007/McColgan 2008/Siebert 2009), yet has won league championships with Barrie (2006) and Myers (2005). #8) Who will be the Rockets three 20 year-old's next season? Evan Bloodoff, Tyler Matheson, Kyle St. Denis and Geordie Wudrick are all eligible to return. #7) Will Kyle St. Denis return to the Rockets lineup next season? Or are the series of concussions career ending? #6) Who challenges Adam Brown for the starting goaltending duties with the Rockets next season? #5) Does Brett Bulmer get drafted in the 3rd round of the NHL draft this summer? Two months ago Bulmer was projected to go anywhere from the 4th to the 6th round. The last Rockets player to be drafted in the 3rd round was Brandon McMillan ((2008). #4) Who is the Rockets captain next season? Isn't Tyson Barrie the automatic choice if he indeed returns for his 19 year-old season? #3) Regardless of where Barrie plays, does he not wear Canadian colours at the World Junior Hockey Championships next Christmas? #2) Will Shane McColgan be named the WHL rookie of the year at the league's annual awards banquet later this month in Edmonton? #1) Do pro teams look at filling out their assistant coaching positions this summer by seriously looking at Ryan Huska? This upcoming coach has to get some consideration. Huska just completed his third season behind the Rockets bench after taking over the helm in 2007. Veterans Mark Guggenberger and Lucas Bloodoff have been called up by the A-H-L's Manitoba Moose. The Moose open the playoffs Thursday against the Hamilton Bulldogs. Lucas Bloodoff's goal with 7:56 left in regulation time should have sent the Kelowna Rockets second round playoff series back to Prospera Place for a game six, but the Tri City Americans had other ideas. Down by two goals late in the game, the Americans scored twice, including the tying goal with the goaltender pulled with 1:24 left in regulation time. Then in overtime, forward Kruise Reddick scored the game winning goal with a blast from just inside the blue line that beats goaltender Mark Guggenberger between the legs. Game over. Series over. 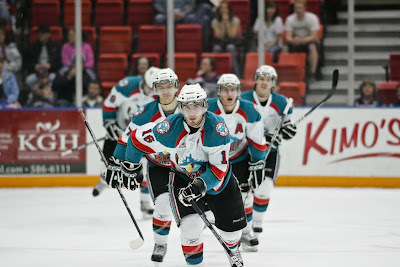 Tri City Americans 4, Kelowna Rockets 3. The Am's eliminate the Rockets in five games. You won't have success without secondary scoring, and the Rockets found that out first hand in this series. The line of Lucas Bloodoff, Brandon McMillan and Geordie Wudrick were in on all three goals in the game five loss. In fact, of the 11 goals scored in the series by the Rockets, that line combined to score nine of them. Who was the best player on the ice in game five? He wasn't granted a star, but Brandon McMillan ended his junior career with a terrific performance. McMillan scored once shorthanded, had an even strength breakaway goal, and set up Lucas Bloodoff's third period goal to make it 3-1. McMillan will be playing his 20 year-old season in the Anaheim Ducks organization next season. His final game in a Rockets uniform was lights out. Mark Guggenberger again proved that he indeed comes to play in the playoffs. The 21 year-old goaltender was again sharp and can't be blamed for allowing the game winning goal. Reddick essentially moves away from a sliding Brett Bulmer before walking into a slap shot that goes through Guggenberger's legs. Reddick is the hero for a second straight game after also scoring the winner on the power play in game four. Lucas Bloodoff's final game with the Rockets was a memorable one. The Rockets captain had three goals in the series, none more impressive then his diving stab at a puck in game five that was sent towards the goal by line mate Brandon McMillan. If the Rockets rookies can take one thing away from Bloodoff's performance in the playoffs, it was his work ethic. As good as the Rockets power play was during the regular season, it struggled in the playoffs. While it showed signs of improving in an opening round series against Everett, it went totally flat against Tri City. In the five games against the Americans it went 2 for 19. That's good for an efficiency rate of just 10.5%. In game five the Rockets were granted a 5 on 3 in the second period but were unable to score. It could have been a difference maker in the series, but failed to manufacture a goal in three of the last four games of the series. The Tri City Americans are a fun team to watch. They have the ability to change the game in a matter of seconds thanks to their skill level. This team works hard, never gives up, yet plays a clean-hard nosed game. Congratulations to Americans GM Bob Tory, head coach Jim Hiller and the players, for an enjoyable series. With three of the five games decided by a single goal, it just showed that these two teams were evenly matched despite the 21 point deferential in the Western Conference standings. The Rockets played 84 games this season....72 regular season and 12 playoff games. In the playoffs, those 12 games were played in just 22 nights. The game photo used on this blog is courtesy of John Allen Photography. Rockets season comes to an end! Americans beat Rockets in overtime (4-3), winning the series in five games. Sunshine greeted the Kelowna Rockets this morning as they made their way down for a pre-game skate. The Americans were on the ice upon their arrival and appeared to be a loose bunch prior to game five. Why wouldn't they be? They have a 3-1 lead in the series, with three chances to put the Rockets away. All the pressure is on the Rockets. The Americans are no strangers to being in this position. In an opening round series against Chilliwack, the Am's had a 3-1 lead only to lose game five at the Toyota Center. A game six back in Chilliwack saw the Americans end the best of seven series with a 4-1 win. I spoke to Americans forward Kruise Reddick this morning. The 19 year-old scored the game winning goal on the power play Wednesday night. I've always believed interviewing a player from the opposition gives our radio listeners a better appreciation of an individual who's name bar is the only thing that separates him from his teammates. Reddick was a pleasure to interview. He comes out of the Americans dressing room with a smile on his face and a hand shake. I should have figured he was a good guy. Reddick is from Manor Saskatchewan. The Americans are not immune to losing three straight games. The Am's lost three games in three nights from March 5th to the 7th. Those losses came to the hands of Chilliwack, Portland and Seattle. Today is April 9th. The last time the Rockets played a game on April 9th was back in 2006. The Rockets were a 3-2 winner over Everett. The leading scorer in this series for the Rockets is Brandon McMillan. McMillan has 3+2=5 in four games. Justin Feser is the Am's top scorer in this series. Feser has 1+4=5. McMillan and Sergei Drowzd both have three goals in this series to lead all goal scorers. The Americans have opened the scoring in three straight games. Rockets forward Geordie Wudrick opened the scoring in game one. You have to give credit to the Tri City Herald newspaper for sending beat writer Annie Fowler on the road. In a day where the newspaper business is trying to keep their head above water, the Herald has forked out some cash to send Fowler on the road to cover the team. The same can't be said for the Kelowna Daily Courier, who is working with a small sports department which consists of just two writers/reporters. Rockets beat writer Doyle Potenteau is covering the road games from the comfort of his desk at the Courier's downtown offices. Under the circumstances, Potenteau is doing a great job. Speaking of Fowler, the rumour around the arena is she threatened the Herald editor with her finger nails to let her cover the Americans on the road during the playoffs. I guess she threatened to scratch the editor to death if she didn't get her way. If you haven't see them - the finger nails - they are worth a look. How she types with those things is beyond me. I was going to post the photo, but I forgot my camera in Kelowna. I nice added touch at the Toyota Center is a sign entering the visitors broadcast location that says 'Kelowna Rockets radio broadcast booth', with the Rockets logo on it. Small detail yes. Appreciated? Absolutely! It's time to put on your rally caps....or in hockey, your rally helmets. The Kelowna Rockets have no choice. Playoff elimination stares them squarely in the face in their best of seven series with the Tri City Americans. Win and you live another day. Lose and your season is over. This is nothing new to a Rockets team, who faced playoff elimination squarely in the face twice in an opening round playoff series with Everett and beat the odds, not once, but twice. The Rockets beat the Tips in game six before earning a one goal victory in game seven to solidify a date with the Tri City Americans in round two. Looking at winning the next three games against the Americans is simply too daunting though. You have to take the approach of playing one game at a time. In practical terms, look at any experienced mountaineer who has eventually reached the summit of Mount Everest. The successful climbers of Everest don't look at the final goal as they begin to tackle the highest mountain on earth. Instead they strategically stop along the way as they make the ascent. Called stages, they hike to a certain point, and after accomplishing that feat, they indeed find themselves a step closer to reaching the final destination, the top of the mountain. This approach has successfully enabled over 27 hundred explorers to conquer the highest distance above sea level. The Rockets need to take that same approach in their playoff series with the Americans. The ascent officially begins tonight for the Rockets at the Toyota Center. The Kelowna Rockets find themselves down 3 games to 1 in their playoff series with the Tri City Americans. Being in a 3-1 series hole is nothing new in this years WHL playoffs. The Calgary Hitmen were in a similar situation in an opening round series with the Moose Jaw Warriors. Down 3 games to 1, the Hitmen would win game five (5-2), win game six (7-3) and game seven (6-2). Calgary did have home ice advantage mind you, but it just shows that it can be done, and it has as recently as this years playoffs. Drew Owsley was the smallest man on the ice Wednesday night, yet the 5 foot 8 goaltender made the biggest impact. Owsley made several sensational saves, some of the eye popping variety, in the Tri City Americans 3-2 win over the Kelowna Rockets. The victory gives the Americans a 3-1 series lead, heading into game five tomorrow night at the Toyota Centre. Owsley showed the 54 hundred fans that he was ready to play after making a sparkling glove hand save off of defenceman Tyson Barrie before being step for step with rookie forward Max Adolph on a first period penalty shot. Owsley was lucky too, yet when a goaltender is on his game, even the bounces tend to go your way. Owsley faced 35 shots on the night and was the main reason why the Americans are now one win away from advancing to the Western Conference final for the first time since 2008. It was the Rockets best game of the series. Often times dominating play territorially, the Rockets were physical, first on pucks, and showed urgency throughout the game, something that was sorely missed one night earlier in a 2-0 home loss. Yet, while the Rockets effort was much improved, the teams power play struggled again, going 1 for 6 with the extra man. The Rockets were given a golden opportunity late in the third period to find the equalizing goal but were unable to create some late game heroics to send the game into overtime. While the Rockets were given a late power play chance to tie the game, a missed call on the ensuing man advantage would have made for even a more dramatic finish. Referee's Andy Thiessen and Derek Zalaski blindly miss a tripping call when Brett Bulmer is clearly taken down by Am's forward Johnny Lazo just inside the Tri City blue line. The Americans may have been outplayed, but they received timely goals, including two goals shortly after the Rockets would tie the score. Tyson Barrie scores on a power play to make it 1-1 before the Americans score 18 seconds later to make it a 2-1 game. Brandon McMillan brings the Rockets to within a goal at the 10:41 mark of the third period, before Kruise Reddick scores the game winner just a minute and 10 seconds later to give the visitors a one goal edge. Despite making just 10 saves, Mark Guggenberger did not struggle despite allowing three goals. A good team like Tri City needs little room to create solid scoring chances, and made the most of the limited opportunities the Rockets gave them. Game five is Friday night at the Toyota Centre, a place where the Rockets split the opening two games of this series. The Rockets fell 5-3 in game one before earning a 3-2 win in game two. A Rockets win Friday sends the series back to Kelowna for a game six Sunday afternoon (5 pm). Americans take a 3-1 lead in the best of seven series. NHL Central Scouting has released it's final ratings of the players eligible for this summers NHL draft. 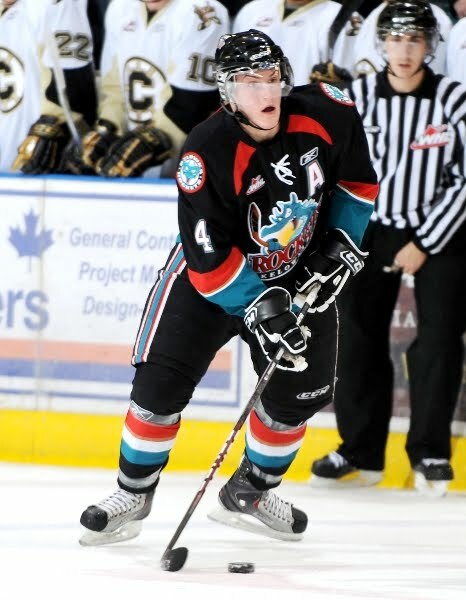 Kelowna Rockets forward Brett Bulmer is projected to be selected in the third round and is rated 65th among North American skaters. What makes Bulmer's ranking so interesting is the Prince George resident moved to 65th after being earmarked at 164th at Central Scoutings mid term rankings. Rockets defenceman Antoine Corbin made some strides in the final half of the season. After not being rated, Corbin is now ranked 171st. Defenceman Mitchell Chapman dropped from 151st to 193rd among North American skaters. The NHL draft is this summer in Los Angeles. Mark Guggenberger was ready to play. Unfortunately his teammates didn't follow the veteran goaltenders lead. The 21 year-old was again steady, but his Kelowna Rockets teammates looked lacklustre, in a 2-0 loss Tuesday night to the Tri City Americans. The Americans now have a 2-1 lead in the best of seven series heading into game four tonight. You know it's a bad sign for the home team when you can pick several names from the visiting team's roster that played well, yet you struggle to find names on who was a bright spot on the Rockets roster. Lucas and Evan Bloodoff showed some jump while Brandon McMillan was noticeable in the final five minutes of the game, but outside of that, the Rockets had too many passengers on this night. If all hands are not on deck, the Rockets can't compete against a high end team like Tri City. They simply can't. Not even Mark Guggenberger can stand on his head and bail his team out after an effort like that. Who had a bad game for Tri City? I can't name one guy. From Justin Feser to Jordan Messier, the visitors were really good. Americans goaltender Drew Owsley gets the win and the shutout, but even he will tell you at the end of the night that he has earned more difficult shutouts than he did against the Rockets. Americans head coach Jim Hiller will have a tough time picking apart his team on video after game three. In fact, a 2-0 loss likely flattered the home team. The Rockets had three power plays in the third period alone and were unable to score. One power play saw the Rockets called for offside three separate times. What does that tell? Mentally the Rockets weren't there. In game two, all three goals the Rockets scored were essentially on the doorstep of the Americans net. The majority of the 31 shots Owsley faced Tuesday night were from long range or from the outside. The smallest crowd of the season watched game three. Just over 52 hundred Kelowna Rockets fans took in the game. The shutout loss was the Rockets second of the playoffs. 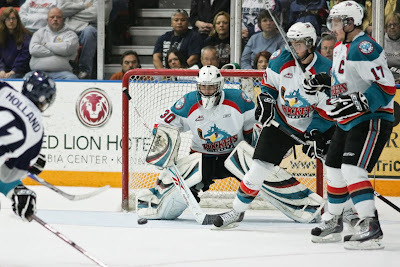 The Rockets also lost 4-0 to Everett in game five of an opening round series. 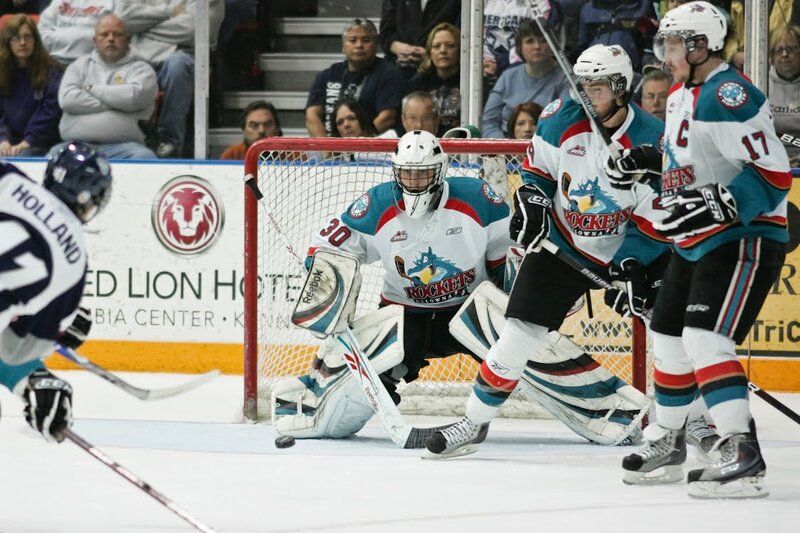 It marked the first time on home ice that the Rockets have been shutout in a playoff game since a 1-0 loss to the Everett Silvertips in game five of the Western Conference final April 24/04. Jeff Harvey made 22 saves in the win. The loss snapped the Rockets unbeaten streak on home ice at three games. The Rockets won all three home games in a seven game series against Everett in the opening round. The good news is the Rockets can redeem themselves in game four Wednesday night. Americans have a 2-1 lead in the best of 7. Tonight’s Preview: The Rockets and Americans are meeting in game three of a best of seven Western Conference semi final series. The series is tied at one win each after the Rockets earned a 3-2 win Saturday night. The Americans won the opener by a 5-3 score. Game four is tomorrow night at Prospera Place before the series shifts back to Kennewick Washington for game five Friday night. If a game six is necessary, it will be played in Kelowna Sunday night. The Rockets and Americans are meeting for the 4th time in the WHL playoffs since the team re-located to Kelowna. Last season the Rockets beat the Americans in a hard fought six game series. The Americans would win the first two games at home before the Rockets would win the next four games to advance to the Western Conference final against Vancouver. The Rockets are playing in the second round courtesy of a seven game series win over Everett in the opening round. The Rockets are making their 18th appearance in the WHL playoffs in 19 seasons as an organization. The only playoff miss was back in 2006-2007. Digging deeper: The Rockets have been out-shot 80-57 in the first two games. The Rockets are 1 for 3 on the power play (33.3%) while the Americans are 1 for 6 (16.7%) with the extra man. Game two recap: Spencer Main had a goal and an assist leading the Rockets to a 3-2 win Saturday night. Lucas Bloodoff and Brandon McMillan also scored for the Rockets, who were out-shot 37-28. The Rockets were 0 for 1 on the power play while the Americans were 0 for 2. Mark Guggenberger was named the games 1st star. Game one recap: Two goals in a span of 25 seconds in the third period broke open a 2-2 game, lifting the Tri City Americans to a 5-3 win in game one. Brandon McMillan scored once and added two assists while Geordie Wudrick (1+1=2) and Lucas Bloodoff (1+1=2) also scored in a losing cause. The Rockets were out-shot 43-29. Kelowna was 1 for 2 on the power play while the Americans were 1 for 4 with the extra man. Game Day Tidbits: The Rockets beat a U.S Division team just five times during the regular season. In this years playoffs the Rockets have already won five times in nine games against a U.S based team…. Geordie Wudrick has nine playoff goals. That leads the WHL in goals scored in the playoffs. In case you are wondering, Jamie Benn had 13 in last years post season….Five players on the Rockets roster have 38 games of WHL playoff experience. Lucas Bloodoff (11+9=20), Brandon McMillan (2+14=16), Tyson Barrie (6+26=32 points), Collin Bowman (1+7=8) and Geordie Wudrick (15+7=22) lead the way…Wudrick’s eight goals in a playoff series against Everett is a franchise record. 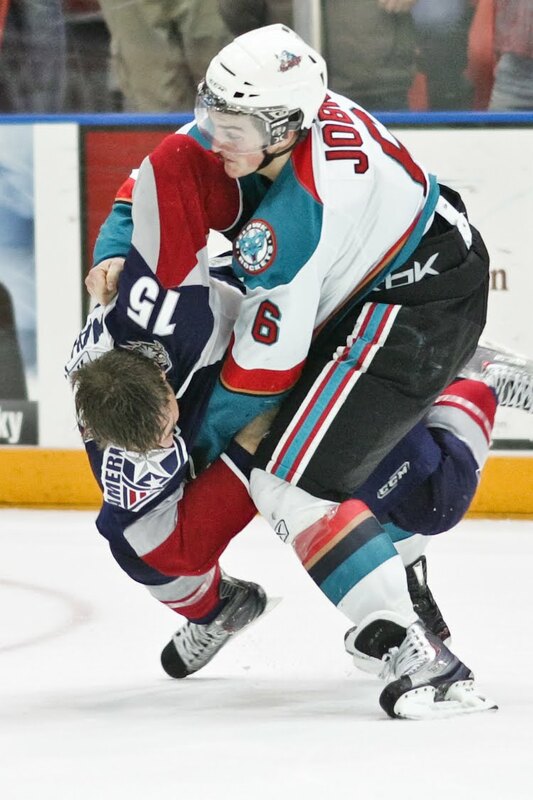 Jesse Schultz had five goals in a playoff series against Red Deer in the 2003 WHL final…Tyson Barrie led the Rockets offensively in the opening round with 9 points (2+7=9). Barrie had points in five of the seven games in the opening round…McMillan leads the Rockets with a +5 rating in the playoffs….Guggenberger has started six straight playoff games after relieving Adam Brown in game three of the Everett series…Guggenberger is 10 and 4 in 14 home playoff games over his career. 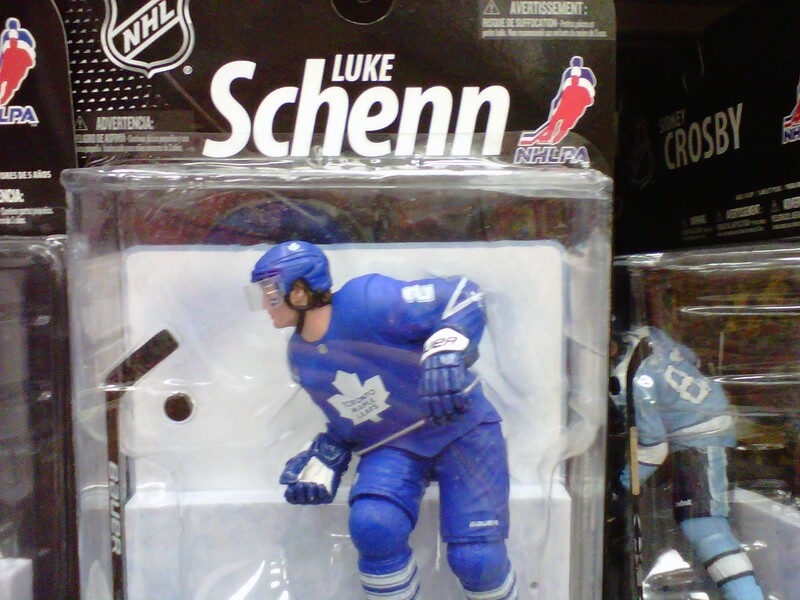 On toy shelves everywhere. 'Schenner' in all his glory. The Rockets have scored six goals in the first two games of their playoff series with the Tri City Americans, after a 5-3 loss in game one and a 3-2 win in game two. The Rockets scored just six goals in four games against the Americans during the regular season. Take note. When the whistle blows, rarely do the Americans get involved in pushing and shoving after the play. We have seen little extra curricular activities once the whistle blows and the Rockets have caught on early. Americans coach Jim Hiller says he wants to see his team play hard, but when the whistles blows, things screech to a halt. Man do they. The Americans are the best in the league at it. Drew Owsley. The Americans goaltender does not like to play the puck. 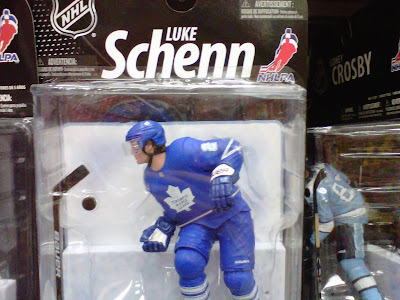 In fact, has he played the puck even once in this series? A non-puck handling goaltender, unlike Mark Guggenberger, makes it extremely tough on your defenceman, who need to come back and retrieve pucks and often times pay the price by being hit by an opposing forward. The Rockets top two forwards in terms of work ethic in the first two games without question is Lucus Bloodoff and Brandon McMillan. These two veteran players want it. Sure, both have two goals in this series, but they are hard to play against. They are as committed to the defensive side of the game as they are to the offensive side. They are fun to watch because of the intensity they bring and the willingness to win puck battles. Officiating. Whistle happy referee's are the worst. I applaud the officiating crews in games one and two for not getting involved. Sure, soft infractions have been overlooked, but the games are being decided by the two teams, not with the help of an official that wants to get every ones attention. STAY OUT OF IT. Do you notice that when the referee's are good, the linesman are often bad? Can't we have everyone on the same page for once! While the Rockets have been out-shot in both games, those numbers don't concern me at all. The Rockets are creating enough quality chances in the offensive zone five-on-five. Those shot totals would be higher if the Rockets were granted more power plays, but the Americans just don't take dumb penalties. They don't take the lazy ones, so the penalties the Rockets create will have to be earned. My concern would be high shot totals and struggles around the net. The problem often doesn't get better, it becomes worse. He sure looks good at practice. Cody Chikie is waiting for the doctors ok to be injected back into the lineup. An x-ray early this week should give him to the go ahead to re-join his teammates in either game three or four. But where does he play? Limited ice time will obviously be part of the process as he gets back up to speed. I spoke with Americans defenceman Riley McIntosh before game two. Always a smile on his face, McIntosh has not played a single playoff game after being edged out as a top six defenceman. I will admit to having a soft heart for a player who is now 19, isn't playing, and will be hard pressed to play as a 20 year-old with the Americans next season. When I think of McIntosh as a member of the Rockets, the one image that comes to mind is his 6 foot 5 frame sitting on the bus beside 6 foot 7 inch Tyler Myers. When they were rookies, McIntosh and Myers were inseparable. They would sit with each other on the bus and would often be seen sleeping in the same position. Two big, lanky kids, enjoying each others company while traveling across Western Canada. How times have changed. One is now flying around the country on a charter aircraft (Myers) making big money, while the other (McIntosh) likely has two seats at the back of the Americans bus to stretch out. Gord McGarva and I were treated tremendously by the Americans organization over the first two games. This organization has a small market feel to it, yet they produce big time results. General Manager Bob Tory is the reason why this organization is so well respected across the league. Sure the winning record is vital, but the way the day-to-day operations are handled gives it a family feel. That's the vibe I get as an outsider. I appreciate the Tri City fans that have stopped by this blog over the last couple of days. For those that leave comments, I may not agree at times, but I respect your opinion. If I didn't, I wouldn't post them. It's not a matter of who's right or wrong on a particular issue, but the dialogue between fans is always healthy. I count this as a privilege to be chatting about our teams at this time of the season because were are fortunate to be watching playoff hockey. I hope you feel the same. Congratulations to Cody Almond for scoring his first NHL goal tonight in Minnesota's overtime loss to the Vancouver Canucks. Mark Guggenberger's ability to bounce back from a bad goal may be his greatest asset. The 21 year-old goaltender gave up a soft goal less than three minutes into Saturday night's game, but then made several sensational saves, leading his team to a 3-2 win over the Tri City Americans. The series is now tied at one win apiece with games three and four on home ice Tuesday and Wednesday night. The soft goal is the result of a weak backhand from Americans forward Sergei Drozd that misses the net. The puck goes off the end boards and hits the inside of Guggenberger's pad while he is in the butter fly. The puck then slowly makes its way towards the goal line and just goes it. It's not a goal you want to give up against an Americans team that has no problem generating offense on their own. But hey, it happens. The good news is Guggenberger only gets better as the game goes on, including a tremendous right pad save in the second period off of Americans forward Adam Hughesman. On a bad line change by the Rockets, Hughesman finds himself essentially on a 2 on 0 with Johnny Lazo. Lazo feeds Hughesman the puck, who goes to the forehand and is denied by Guggenberger. It was the best save of the series without question. It keeps the game tied at one late in the second period. Lucas Bloodoff is playing with intensity and was a physical force in game two. The Rockets captain again scores a timely goal and delivered some solid hits, specifically to the Americans defensive core. Bloodoff is leading the physical assault while scoring goals in four straight games. The Americans were extremely physical in game one, but they were no where near that aggressive in game two. The Rockets stayed the course and attempted to hit the Americans at every opportunity. That will pay dividends as this series continues. Collin Bowman also amped up his physical play in the third period. Defenceman Dallas Jackson looks better in this series than he did in the opening seven games against Everett. Jackson is more physical, yet is still contributing offensively. Jackson has two assists in the series, but more importantly is a +3. The line of Shane McColgan, Brett Bulmer and Mitchell Callahan upped their play in game two. The line was extremely quiet in game one, but answered the bell with more jump. That line is without a point in the first two games. It's not often you see only three minor penalties called in a playoff game, but referee's Pat Smith and Steve Papp did their best of staying out of the way and letting the teams decide it. This game had infractions, no question, but it wasn't a tightly called game. Trying to draw a penalty took an embarrassing turn for Americans rookie defenceman Zach Yuen. Yuen appears to get a high stick in the face and attempts to over sell it by throwing his gloves and stick to the ice. The problem is, the supposed high stick isn't called leaving the 16 year-old essentially useless to his team, as the Rockets control the puck in the offensive zone. The Rockets fail to capitalize, but Yuen gets an earful from Americans head coach Jim Hiller when he gets to the bench. I don't think Yuen will pull that act anytime soon. Happy belated birthday to Americans GM Bob Tory. The above photo courtesy of John Allen Photography. Rockets win 3-2 and now tie the series at one win apiece. Mark Guggenberger stretches across to make a save. Colton Jobke takes matters into his own hands with a fight with Brooks Macek late in the 3rd period. Two goals in a span of 25 seconds early in the third period helped the Tri City Americans to a 5-3 win over the Kelowna Rockets Friday night. The win gives the Americans a 1-0 lead in the best of seven second round playoff series, with game two Saturday night at the Toyota Center. For the second straight playoff game, the Rockets open the scoring courtesy of Geordie Wudrick's 9th goal of the playoffs. Wudrick responds just 43 second into the opening period to give the visitors a 1-0 lead. Two of the Am's goals were the direct result of miscues by two key veterans. Tyson Barrie makes an ill advised cross-ice-pass in his own zone that lands on the tape of Americans forward Justin Feser. Feser skates in on a clear cut breakaway, beating Guggenberger to the blocker side. Wudrick then fails to keep a puck in at the Americans blue line in the third period, which creates an odd man rush the other way. The Am's score to essentially put the game on ice. At that point, the Rockets were taking over the play after a Brandon McMillan goal made it 4-3. I thought goaltender Mark Guggenberger had a strong game for the Rockets. Sure he gave up five goals, but he also made solid saves when the game was up for grabs. Americans forward Brooks Macek delivers a dangerous hit on Rockets leading scorer Geordie Wudrick at the midway point of the third period. While on the power play, with Macek in the penalty box, Rockets defenceman Dallas Jackson attempts a pass to Wudrick, who is looking back to accept the puck. As the puck approaches Wudrick, Macek steps out of the penalty box and blindsides the unsuspecting forward, sending him flying in the air and crashing heavily on the ice. Macek is not accessed a penalty while Wudrick is helped off the ice. Amazingly Wudrick returns a short time later. 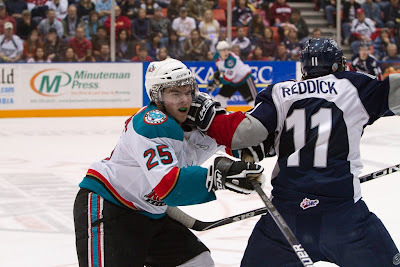 Rockets rookie defenceman Colton Jobke fights Macek late in the game in a one sided affair. Macek knew something was coming after the hit, so it was best to own up to the questionable contact. Is Macek still a marked man? The series has just begun. After watching the hit on video, it was clean, no question. It was not a hit to the head. Is it dangerous? You bet it is. Macek notices that Wudrick is vulnerable, and gives it to him. All is fair in love and war. That hit tells me that on the ice, this is indeed a war. Rockets captain Lucas Bloodoff also delivers a big hit in the third period on Am's defenceman Jarrett Toll between the two benches. Toll notices Bloodoff coming and losses the physical battle. I like the fact that Toll, despite being crunched, gets up quickly and moves back into the play. Special thanks to the Tri City American organization and the Toyota Center staff for helping us with what appeared to be a phone line problem prior to the start of the game. We were unable to broadcast the game until about halfway through the first period. As it turned out, it had nothing to do with the phone line at the Toyota Center, but rather with an operator error at the radio station back in Kelowna. Just under 4 thousand fans watch Friday's game. It may have been a smallish crowd, but man do they make noise. You have to love the American sports fan. I will take four thousand fans cheering and making noise throughout the 60 minute affair over 6 thousand fans who need to be urged to make noise. Americans have 1-0 lead in the best of seven series. More later. Obviously you are not listening to the Rockets game because of technical problems here in Tri City. We are working to see if it is from this end, or at the radio station's end. It is 1-1 halfway through the 1st. Rain welcomed the Rockets this morning as they headed to the Toyota Center for a light workout before game one against the Tri City Americans. 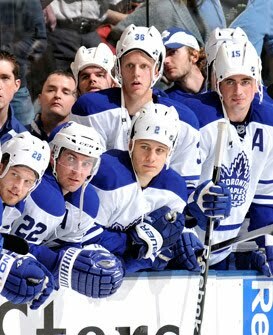 No question who the starting goaltenders are in this series. Mark Guggenberger is front and centre for the Rockets while the Americans go with Drew Owsley. 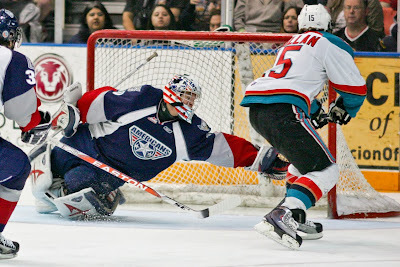 Owsley spent last season as the Americans backup in a second round series with the Rockets under starter Chet Pickard. Cody Chikie looks close. It has been exactly 6 weeks since the Rockets rookie forward went down with a broken collarbone. Don't be surprised to see him in this series at some point. Chikie scored 18 goals during the regular season and would be a welcome addition on the forward ranks. What type of crowd can we expect in game one? If game five was an indication in the opening round, 45 hundred fans should gather to watch the opener between the Rockets and Americans. The Toyota Centre seats just under 58 hundred. The Rockets have publicly stated that they again want to play a physical series in an effort to wear the Americans down. The Americans didn't have that intimidating, big body presence at forward last season, but have addressed that problem with the acquisition of forwards Todd Kennedy and Mike Brown. Both Kennedy and Brown like to intimidate and will make sure the Rockets don't take liberties in this series. I hope the Rockets see a lot of Brown and Kennedy. Why? The more Kennedy and Brown are on the ice, the less you will see the Americans top offensive talents. Look out for Americans forward Brendan Shinnimin. Shinnimin had 19 power play goals this season, second only to league leader Joel Broda of the Calgary Hitmen. Shinnimin had five goals in an opening round series with Chilliwack. The 18 year-old did not score a goal against the Rockets in last years second round series. Steady Eddie on defence. That would describe the play of Brett Plouffe, Jarrett Toll and Tyler Schmidt. These three won't wow you with points, but they play against the other teams top line and do a great job of shutting down the opposition. Not discrediting what Owsley did in goal this season, but Schmidt, Toll and Plouffe deserve a lot of credit for the goaltenders impressive statistics. We are on the air at 6:35 tonight. C u then! Tonight’s Preview: The Rockets and Americans are meeting for the 4th time in the WHL playoffs since the team re-located to Kelowna, and for the second consecutive playoff in round two. Last season the Rockets beat the Americans in a hard fought six game series. The Americans would win the first two games at home before the Rockets would win the next four games to advance to the Western Conference final against Vancouver. The Rockets are playing in the second round courtesy of a seven game series win over Everett in the opening round. The Rockets dropped the first two games in Everett before winning games three and four on home ice. After the two teams won at home in game five and six, the Rockets earned a 2-1 win in Everett in game seven Monday night. Game one and two of this second round series are in Tri City tonight and tomorrow, with games three and four back in Kelowna Tuesday and Wednesday night. If a game five is necessary, it will be played Friday April 9th back at the Toyota Centre. The Rockets are making their 18th appearance in the WHL playoffs in 19 seasons as an organization. The only playoff miss was back in 2006-2007. 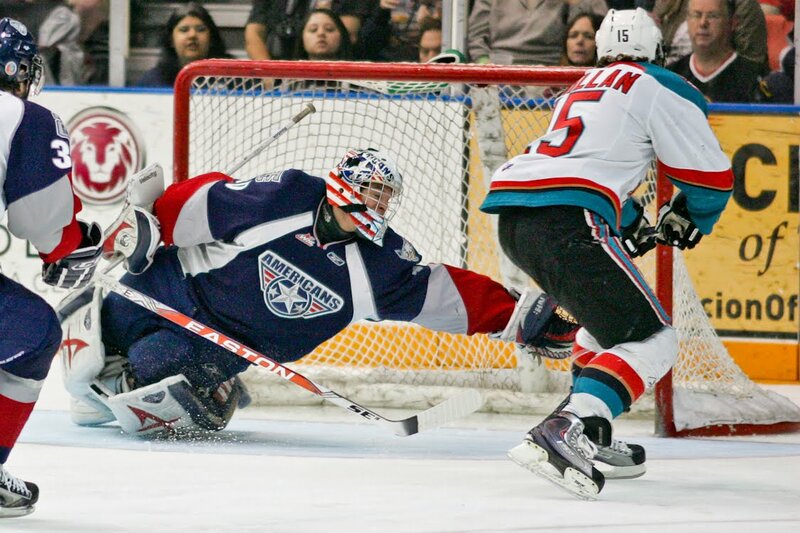 Tri City Season Series: The Rockets and Americans met four times this season. The Rockets were 0-4-0-0 and were out-scored 20-5. The schedule saw the Rockets play the Americans four times in the first 31 games. After December 5th, these two teams failed to play one another. The Rockets were 4 for 25 (16%) on the power play in the four games while the Am’s were 4 for 19 (21.1%) with the extra man. Looking closer: As was the case in a round playoff series with Everett, the Rockets had 21 fewer points than the Americans during the regular season. The Americans scored 48 more goals while the Rockets allowed 32 more goals against. The Americans were granted the second most power play chances in the league (368) during the regular season. Only Calgary had more power play chances (372). Kelowna had the third most chances with the extra man (364 – tied with Medicine Hat). Game Day Tidbits: Lucas Bloodoff scores big goals in the playoffs. Bloodoff had the game winner in game seven against the Tips in round one. Bloodoff scored three goals in last years second round playoff series against the Americans. Bloodoff scored in game one, three and five. Bloodoff also scored in game four against Vancouver in the conference final and then in game six of the WHL final…..Geordie Wudrick has eight playoff goals. That leads the WHL in goals scored in this years playoffs….Six players on the Rockets roster have 36 games of WHL playoff experience. Lucas Bloodoff (9+8=17), Brandon McMillan (0+12=12), Tyson Barrie (6+25=31 points), Collin Bowman (1+7=8) and Geordie Wudrick (14+5=19) lead the way…Wudrick’s eight goals in a playoff series is a franchise record. Jesse Schultz had five goals in a playoff series against Red Deer in the 2003 WHL final…Mark Guggenberger is 4 and 1 in this years playoffs. Guggenberger is facing the Americans for the first time since game one of last years WHL playoff series. It is almost one year to the day since Guggenberger faced the Am’s after losing game one of last years second round series on April 3, 2009….Tyson Barrie led the Rockets offensively in the opening round with 9 points (2+7=9). Barrie had points in five of the seven games in the opening round…Brandon McMillan has a point in six of seven games in this years playoffs. McMillan was held off the scoreboard in game five…McMillan leads the Rockets with a +6 rating in the playoffs….Shane McColgan, Antoine Corbin, Codey Ito, Brett Bulmer and Spencer Main all scored their first career playoff goals in round one….The Rockets opened the scoring just once in seven games against the Tips in the opening round….Guggenberger has started four straight playoff games after relieving Adam Brown in game three of the Everett series….Geordie Wudrick is playing in the month of April for only the second time in his WHL career. Wudrick was with the Swift Current Broncos in a second round playoff series against the Calgary Hitmen in 2008….Americans head coach Jim Hiller and Rockets assistant coach Dan Lambert were both selected in the 1989 NHL draft. Lambert was selected by Quebec in the 6th round while Hiller was chosen by the LA Kings in the 10th round….Lucas Bloodoff was a 6rd round pick of the Americans in the 2004 WHL Bantam draft….Riley McIntosh, now with the Americans, was the Rockets second round pick in the 2005 WHL Bantam draft. 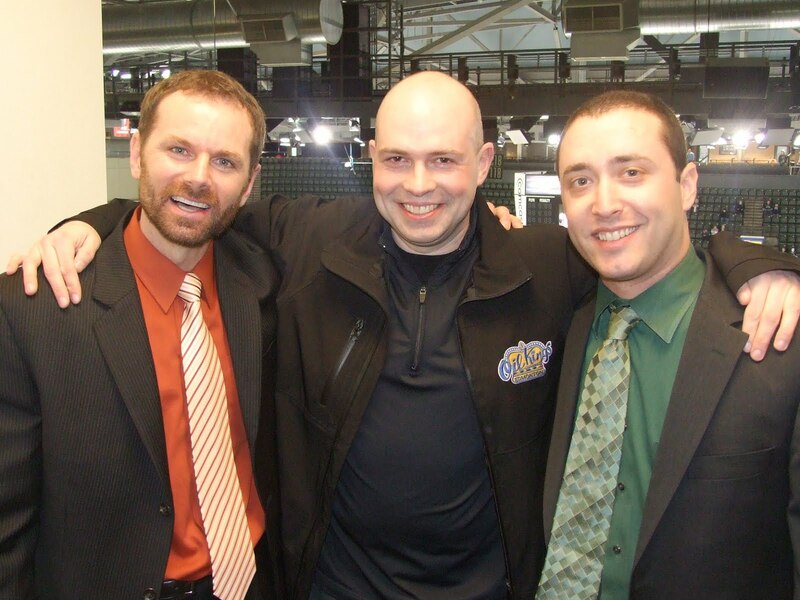 Western Hockey League radio broadcasters are pleased to announce that a three man committee has been established to oversee all aspects and concerns relating to the 22 radio broadcasters across the league. In a meeting held in Everett Washington Mar 29th, Edmonton Oil Kings broadcaster A.J Jakubec was voted as president of the newly formed WHLRBA (Western Hockey League Radio Broadcasters Association) with Jon Rosen, the play-by-play radio voice of the Everett Silvertips, nominated as vice president. Regan Bartel, the radio play-by-play voice of the Kelowna Rockets has been named secretary of the association. None of the other existing 19 broadcasters across the league were involved in the executive voting procedure. The WHLRBA considered inviting Brandon Wheat Kings play-by-play broadcaster Bruce Luebke to the impromptu meeting, but the Wheat Kings jet was unavailable at short notice. Jon Keen, the play-by-play of the Swift Current Broncos was also invited to attend, but was again overseas on yet another winter vacation. Bob Ridley, the long time play-by-play voice of the Medicine Hat Tigers, was invited but didn't show up. Ridley, while driving the Tigers bus to Everett for the occasion, unfortunately ran out of fuel on the Coquihalla Highway. "I think A.J is the best individual to guide us because he talks the loudest," said vice president Jon Rosen. "A.J is clearly the right choice," said secretary Regan Bartel. "I considered voting for Tri City broadcaster Craig West, but the meetings would have taken all night". Rod Pedersen, the play-by-play voice of the Regina Pats, was also considered for an executive post, but his conflict with other fans across the league had the WHLRBA reconsidering naming him to a high profile position. "We would like to distance ourselves from Mr. Pedersen at this time", the three executive members said in unison. The WHLRBA'S main objective is to insure all arena's across the WHL meet certain standards for radio broadcasters. "We have to investigate why no food is being served to the media in Cranbrook prior to game time. That's not the only glaring issue. No washroom facility in the broadcast area in Spokane also has to be addressed", Jakubec added. Over the next few months the WHLRBA will also make available a handbook to all 22 WHL broadcasters outlining certain standards, procedures and helpful hints. 1)Details on various watering holes across the league and where they are located. 2) Suggested positions for sleeping on the team bus. 3) Appropriate conduct tips to keep team management happy. 4) Cough drop suggestions and throat therapy. "I felt sorry for Morley Scott this season", said Rosen. "The new play-by-play voice of the Vancouver Giants had a confused look on his face all season. He needed this handbook to help him make the transition", Rosen added. "I wish I had this detailed handbook whe n I was breaking into the league". The WHLRBA also announced at its recent meeting that a stiff penalty will be issued next season for any WHL broadcaster caught wearing a tie with a cartoon figure printed on it. "If someone is found guilty of breaking this particular rule, a stiff fine will be issued by the association", Bartel added. "This type of clothing violation will not be tolerated. This is no longer the 90's. It must be stopped." The WHLRBA's next scheduled meeting is December 16th, in Las Vegas. If you believe any of what you just read, April Fools! !